In the WSDL, search for “soapbind:address” and find the value in the “location” property of that field, e.g. “https://wd5-impl-services1.workday.com/ccx/service/my_workfront_tenant/Absence_Management/v31.0". The value for “Base URL” should be this value up to the tenant name. In the example listed here, the correct value for “Base URL” would be “https://wd5-impl-services1.workday.com/ccx/service"
Only enter the name of the tenant, not anything else from the URL. In this case, “my_workfront_tenant” would be the correct value. Search “Active Security Groups,” and find the unconstrained Integration System Security Group for “Human Resource System.” Click the three dots to the right of the name of the group, and select “Integration System Security Group (Unconstrained)” -> “Edit”. Then add your integration system user to this security group. Workday Report-as-a-Service (RaaS) is a feature that exposes reports as web services. Azuqua uses this web service to integrate data from Workday to other applications. In order to use the Employee Time Off Updated event, a custom report configured as Advanced type needs to be built first. 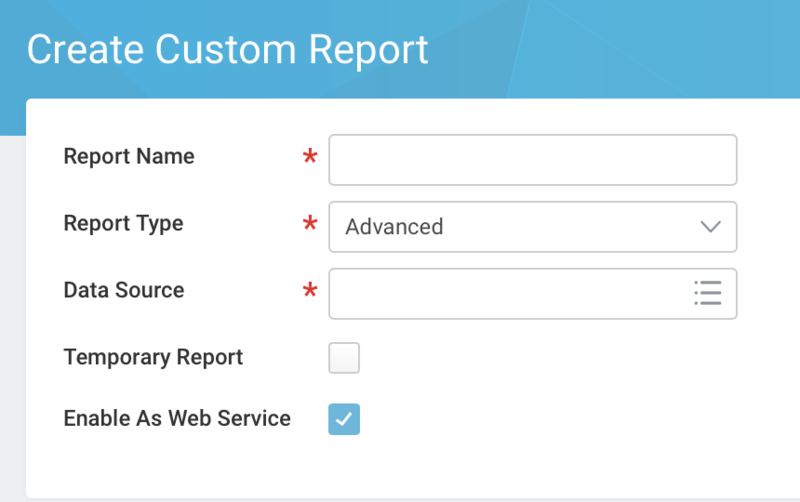 Create advanced type custom report with Web Service enabled. Search for “create custom report” in Workday search bar, open the Create Custom Report task, select Advanced for Report Type, select “Enable As Web Service”, also fill in required fields. Add the report columns that will be used in the integration between Workday and other applications. Note the Column Heading Override XML Alias needs to be the same as in the following image. Add sorting for the custom report that ascends according to Entered On date. Apply filter/logic to compare prompt values against report column values. Only records with Entered On date greater than or equal to the provided value will be included in the report. This helps us to get updated time off records from last checked date. Add the default prompt that is required for the custom report (Entered On). After setting up a successful connection with Workday in Designer, add the monitor Employee Time Off Updated. Note: the time stamps returned from the web service is in the format of “YYYY-MM-DD” without time. In order to minimize the duplicate records, the schedule needs to be configured as Check every Day, or Week, or Month, and it’s better to configure the check time to be at night (e.g. 1AM). Also after setting up the FLO, please manually pull it once. Or records will not return for the first scheduled time. Service (text): The service your request will go to. This will be a string like “Human_Resources” or “Absence_Management.” The full list of Workday API services can be found here. You will need to make sure that the user you are making the call as has the appropriate permissions to access that service through the API.